The quest for the perfect wah-wah pedal is not an easy one. The sound varies a lot from model to model and we don't all want to attack the same frequencies. Any reviews and advice is always very much welcome when discussing this legendary effect... which made us want to ask our readers their opinion. To help you out we chose 50 models among the best-sellers, but we also included in the list several pedals which don't usually get spotlights but nevertheless have a good reputation due to their quality. We also decided to only include models which feature an expression pedal and are still available for sale today. Keeping up with our top lists, this time we asked our French readers the following question: Which is your favorite wah-wah pedal for guitar? The poll to find out our readers' favorite wah-wah pedals was certainly full of lessons. First of all, from the 50 models suggested, 46 got at least one vote. And even if some of them managed to break away from he rest, the results are pretty homogeneous, which just goes to show that the wah-wah market is pretty much up for grabs. Although Dunlop obviously stands out from the rest. Granted, the manufacturer was overrepresented in the starting list, but it nevertheless managed to get four pedals in the top 10, capturing 40% of the votes in total. 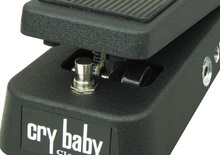 The different Crybaby models seem to still be the go-to option for many, but it was the GCB95 (8%) that landed the top spot. Vox, the other historic manufacturer, also reaffirms its authority with two models among the top 10, the V847A (second, with 7%) and the V845 (3%). So far everything seems quite logical, but we must admit it was surprising to see so many "small" manufacturers make it to the top of the list. Specially noteworthy is G-Lab, who lands the third spot with the MWW-1 Wowee-Wah (6%). Real McCoy and Xotic also stand out with the Custom RMC (5%) and XW-1 Wah (4%), respectively. Morley, the wah-wah specialist, only manged to get one model in the top 10: the Steve Vai Vai-2 Bad Horsie signature series. 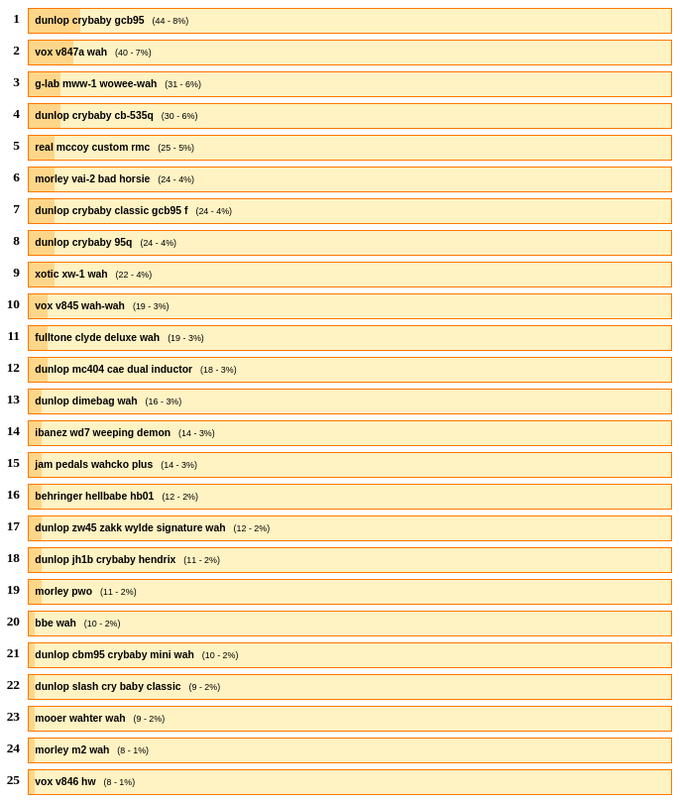 The rest of the results are more anecdotal and pretty close. We can't finish without mentioning a model whose absence was decried by many of our readers: the Budda Wah. Many people mentioned it in the comments to the poll, which makes us think it could've landed a very good spot. So if you are in the market for a wah-wah pedal, you should definitely consider it among your options.